Debra Granik's 2010 "Winter's Bone" was a bleak, powerful film, introducing Jennifer Lawrence to a wide audience in her self-assured performance as a 17-year-old girl trying to keep her family together in the economically devastated Ozarks. Granik's follow-up was the documentary "Stray Dog," showing the psychological struggles of Vietnam vet and activist Ron Hall. Granik's work contains a real social and political critique, even more so since she focuses in on individuals. Her new film, "Leave No Trace," adapted from the 2009 novel, My Abandonment by Peter Rock, combines elements of "Winter's Bone" and "Stray Dog," the young girl off the grid, the troubled veteran living with PTSD. 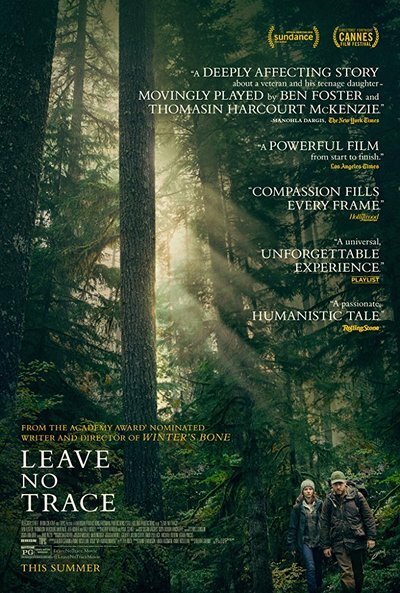 "Leave No Trace" is, at times, heartbreaking, but it's also filled with glimpses of almost casual human kindness, throwaway moments of good will and inclusion piercing through what could be the bleakest of tales. Granik shows great insight into the struggles of those who choose to "opt out," those who just want to be left alone, those who literally can't "fit in" to the larger world. At its very best, it is an immensely moving portrait of a father and daughter who love each other, and who can't bear to be apart. The film starts in a forest of proliferating wet trees and moss, a thick impenetrable wall of green, which turns out to be a public park in Portland, Oregon. Will (Ben Foster) and his 13-year-old daughter Tom (Thomasin Harcourt McKenzie) are first seen chopping wood, playing chess, gathering mushrooms, surrounded by tarps and propane tanks. The opening sequence unfolds with almost no dialogue, giving us an intimate sense of the their routines, their wordless communication and accord. They sleep in sleeping bags, cuddling up for warmth as the rain pours down on their tent. They walk into town to buy groceries. Will makes money selling prescription drugs to people living in a tent city on the outskirts of the park. The life is hard, but the love between father and daughter is undeniable. These two actors are so in sync, so mentally connected, you believe totally they are father and daughter, you believe they've been living in the woods for months, maybe even years. The intimacy between them is so palpable it comes with great anxiety about what might be waiting for them outside the forest. Granik roots her tale in reality, focusing on the details of their lives. It is like they are one being. Their world is a fragile Eden, though, and when a jogger spots Tom one day, cops come and raid their makeshift camp, bringing Will and Tom for questioning. Tom is put into a detention center for teenage girls, and Will is given a battery of psychological tests. The forest gives way, jarringly, to the fluorescent lights of well-meaning but incompetent human bureaucracy. Granik's presentation, though, is idiosyncratic. The expectation may be that bureaucracy would be presented as heartless and cold, and of course in some ways it is. But when Tom wanders into the main room of the juvenile center, two teenage girls tell her they're working on their "dream boards" and does she want to do one too? They offer her construction paper. And Will, totally out of place at a computer, struggling to answer the 100s of questions put to him, is helped by a social worker who walks him through it. "Leave No Trace" is filled with quiet moments like this, and yet it avoids being self-consciously "heartwarming." People are cruel sometimes, yes, but sometimes they are kind too. Will and Tom are reunited, thanks to a kindly stranger who steps forward after reading about them in the newspaper, offering Ben a job and a home on his Christmas tree farm. Ben works, staring at the bound-up Christmas trees flying through the air into a truck, and you don't need dialogue to feel his sense of isolation, his longing to be back in the woods again. Meanwhile, Tom befriends a local farm kid, who invites her to his 4-H meetings, where kids show up with their rabbits. She really likes it. Will experiences society as confining as Procrustes' bed. You can feel how much the presence of four walls and a ceiling torments him, how he won't be able to bear it for long. Debra Granik treats the story with a feather-light touch, while still grounding the film in an almost documentary-style reality. She doesn't "hammer things home," she lets things unfold. There's no didactic preaching about the evils of the world (as "Captain Fantastic," another film about a father who chooses to live off the grid with his children, indulged in). The critique of society is there in the material, but it's implicit, not explicit. How the culture treats its wounded warriors is a disgrace, but—on the flip side— Tom is a child. She doesn't go to school. The culture needs to care about her too. As Will continues to resist, even in the face of kindness, Tom is almost torn in two, by her curiosity about the world, and her attachment to her father. Ben Foster, always a reliably excellent character actor, gives one of the performances of the year as Will. McKenzie, a young girl with a serious face, seems to have emerged out of real life. There isn't a hint of precocious child actress in her. What a discovery she is. The "outsider" is a beloved mythic trope in our culture, from Huckleberry Finn and Holden Caulfield, to "Rebel Without a Cause" and "Easy Rider," to the Beat generation. These figures remove themselves from the constraints of conformity, refuse the comforts of middle-class life, live by their wits, follow the wind. Will and Tom are so close that the thought of them being separated is shattering. You wonder how they will survive it. Will thinks as long as they are camping in the woods together, his demons will be kept at bay. But the clock is ticking. Tom is growing up. Everyone needs to choose their own way. In "Leave No Trace," Granik creates a specific mood, gloomy and yet redemptive, sometimes simultaneously. The redemption is painful, though, because it comes with such a hefty price. The final shot gives the film's title an almost tragic resonance.